The Ryobi JobPlus delivers more innovation and versatility than any other 18V multi-tool on the market. It includes a multi-tool attachment head that cuts drywall, metal, wood, plastic, composite and many other materials; it also sands the finest details. Use multi-tool accessories from the most popular brands with the included universal adaptor, which stores on-board for convenient use. The JobPlus base is compatible with the other interchangeable tool head systems. Like all ONE+ items, JobPlus works with all 18V ONE+ batteries. The 18V ONE+ System introduces the next generation in cordless convenience. This 18 gauge brad nailer features AirStrike Technology, which eliminates the need for noisy compressors, bulky hoses or expensive gas cartridges. This means faster setup and easier maneuvering on the job site. Tackle virtually any trim job with the capacity to drive up to 1,700 nails per charge using P108 4Ah High Capacity LITHIUM+ battery (sold separately).The 18V ONE+ 18GA Cordless Brad Nailer is sold as a bare tool, allowing you to build on your ONE+ collection without spending additional money on batteries and chargers with each tool purchase. Best of all, like every RYOBI 18V ONE+ blue or green tool, this AirStrike Brad Nailer works with any 18V ONE+ battery. The beauty of the ONE+ tool collection is that any Ryobi 18V tool fits with any Ryobi 18V battery. Three battery options enable you to choose between NiCad or lithium-ion compact or high capacity powering over 40 tools. For large scale projects, this Lithium 6-Port Dual Chemistry Charger ensures that you'll have an arsenal of batteries ready and charged for your benefit. While supplies last, the Ryobi 18V ONE+ AirStrike Brad Nailer Kit is available as a Special Buy. Typically sold as a bare tool, the AirStrike Brad Nailer kit includes an 18V ONE+ Compact Li-Ion Battery, a Dual Chemistry Charger, 500 1-1/4-inch brad nails and a belt clip. This 18-Gauge brad nailer features Airstrike Technology, which eliminates the need for noisy compressors, bulky hoses or expensive gas cartridges. This means faster setup and easier manoeuvring on the job site. The Ryobi AirStrike Brad Nailer Drives 18-Gauge nails from 5/8-inch to 2-inch length. 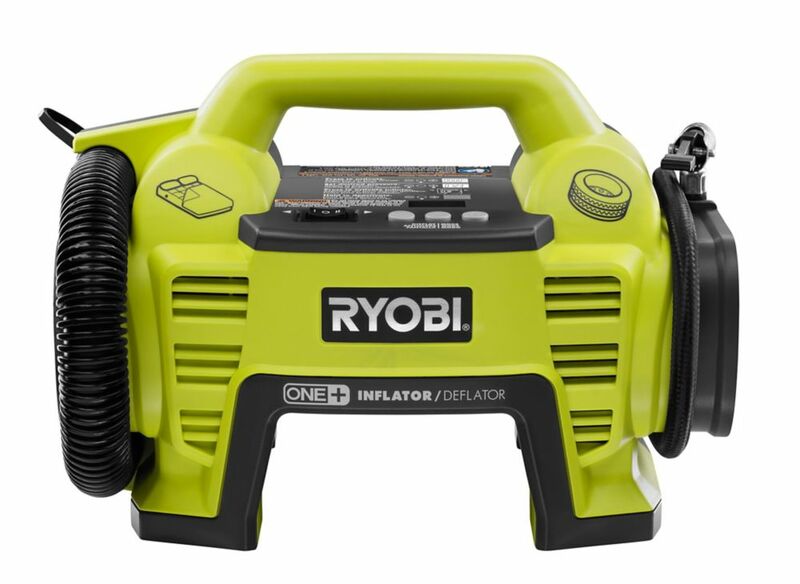 18V ONE+ Dual Function Inflator/Deflator (Tool Only) is rated 4.5 out of 5 by 955. Rated 5 out of 5 by Richard from Works great!... Works great! Rated 5 out of 5 by HomeDepotCustomer from It’s simple to use and has made the job of... It’s simple to use and has made the job of keeping tire pressure correct in both my auto and bicycle much faster and easier. Rated 5 out of 5 by Jim from So far I have only had one opportunity to use... So far I have only had one opportunity to use the high volume side. It inflated and later deflated two queen air beds as I expected. It is fairly compact so it packed easily with my camping gear and uses the same battery as my flashlight. Rated 5 out of 5 by Matthew from Works awesome! ... Works awesome! Rated 5 out of 5 by ABC123 from I have used it to inflate air mattresses, bike tires... I have used it to inflate air mattresses, bike tires (up to 80psi) and car tires. Works quickly and auto shuts off when desired pressure is reached. I’m a little worried about the build quality of the nozzle that connects to the valve on the bike/car tires but time will tell if it holds up. Will this inflate Presta valves? Hi BTmal, Yes, it comes with a plastic presta valve adapter. Does anyone know the maximum psi of the unit? Thanks. This unit will go up to a max of 150 PSI. Hi, can I fit a C7 Leafield adaptor on this inflator? I would love to inflate my SUP with this tool.